Kyiv, 16 January 2015 – The situation in the anti-terrorist operation (ATO) zone is characterized by highly intense fire terrorists open at Ukrainian troops positions. Most complicated situation is in the Donetsk airport area. “Yesterday illegal criminal groups made numerous attempts to storm the airport’s new terminal using heavy artillery, mortars, tanks and Grad rocket launchers. All attacks were repelled by Ukrainian military. The airport is controlled by ATO forces,” informed Colonel Andriy Lysenko, ATO spokesman at a briefing at the Ukraine Crisis Media Center. Terrorists also fired at Ukrainian military positions in Yasynuvatsky and Artemivsky districts of Donetsk region, in Novoaydarsky, Stanychno-Luhansky, Popasnyansky and Slovyanoserbsky districts of Luhansk region. 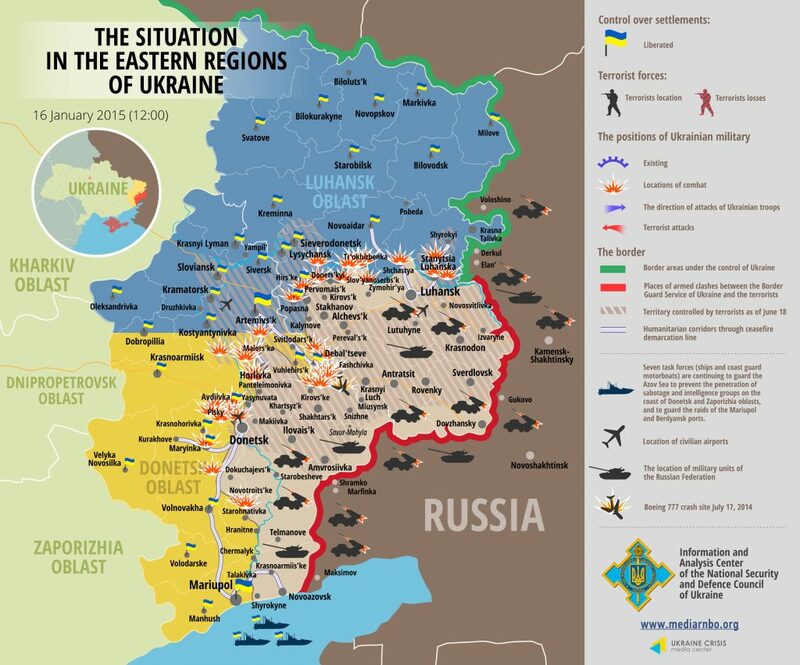 6 Ukrainian servicemen were killed in the last day, 18 got wounded. In recent days militants’ armoured equipment was seen amassed close to the delimitation line. Thus a convoy of tanks was spotted in Horlivka that has stretched 3 km in the direction of Ukrainian units’ positions. Militants continue terrorizing civilian population of Donbas. As per the operational information yesterday in the evening militants’ artillery located near Horlivka and near several districts of Makiivka of Donetsk region changed the direction of artillery fire. “Earlier terrorists fired at Pisky locality, in the evening they opened fire in the direction of residential areas of Donetsk and Yenakieve located on the territory temporary controlled by militants. Illegal criminal groups traditionally blame the shelling on the ATO forces,” noted Colonel Lysenko. Resulting from militants’ shelling of a checkpoint near Fashivka locality of Luhansk region 1 civilian was killed, 1 got wounded. Terrorists also shelled with Grad Artemivsk of Donetsk region and the Luhansk thermal power station located in Shchastia. US Ambassador to Ukraine Geoffrey Pyatt called the assault on the Donetsk airport “the latest example” of the Minsk agreements violation. Russian-backed separatists have to stop violating the ceasefire, he said. Members of the European Parliament in the resolution adopted addressed the European Council calling to take further restrictive measures and reinforce sanctions against Russia in case no progress in settlement of the Ukraine crisis is observed.